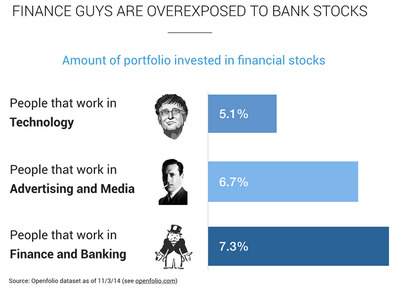 If logic follows, people working in finance would earn more money from their investments than anyone else. After all, investing is their area of expertise. 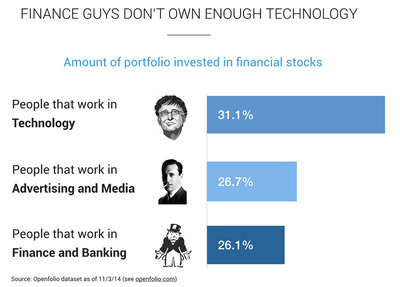 According to new data from investment app Openfolio, however, this doesn’t seem to be the case. 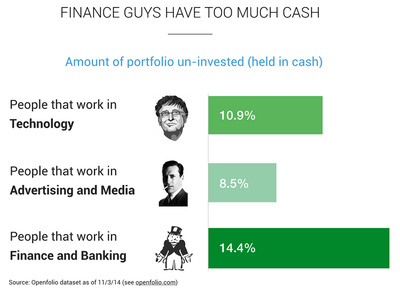 By analysing about 700 portfolios of Openfolio users working in the tech industry, about 500 portfolios of users working in finance, and about 160 from users working in advertising and media, the company found that finance users aren’t the most effective investors and, in fact, are outranked by both of the other cohorts in terms of their portfolios’ performance over the last year. 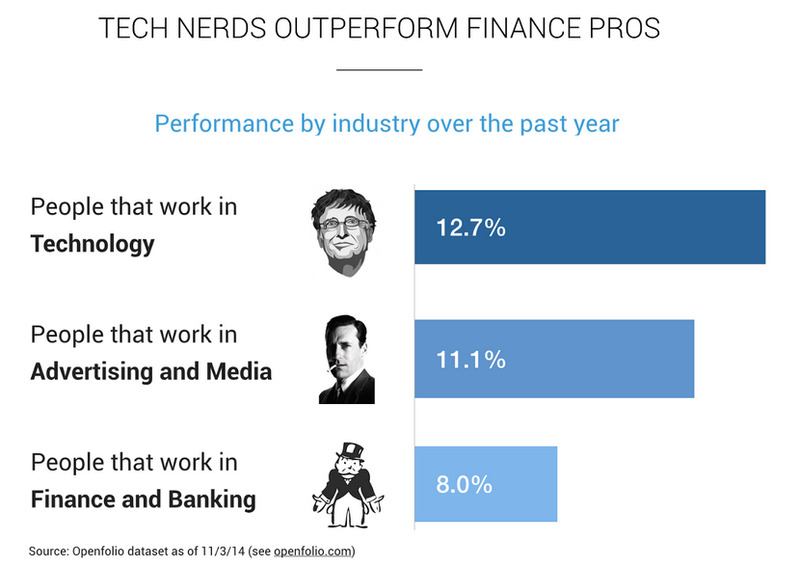 Of course, Openfolio’s analysis is limited to its users and therefore doesn’t address every investor who works in each of the industries addressed, but here is what Openfolio found, and a few possible explanations they suggest influence the results. On average, users working in tech earned a 12.7% return on their investments over the past year, compared to an average 11.1% return experienced by users working in advertising and media, and an average 8% return from the portfolios of those working in finance and banking. 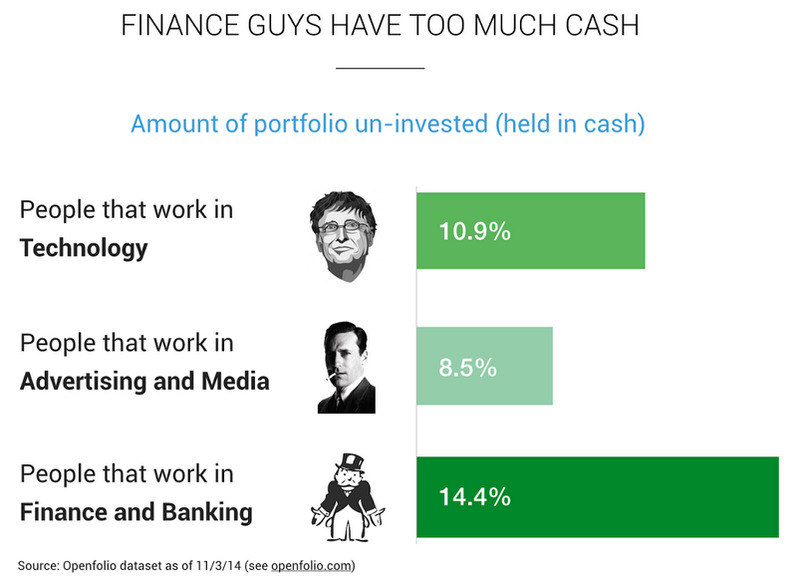 First of all, Openfolio finds, the users included in the analysis who work in finance hold a markedly higher percentage of cash than the people working in tech or advertising and media. By holding cash, they’re keeping that money out of the market and missing out on its gains. They also have a larger percentage of their portfolio in bank stocks, presumably because they’re given bonuses in the form of company stock that they can’t sell. Plus, they may be more likely to buy bank stocks because that’s what they’re most familiar with, working in the industry. 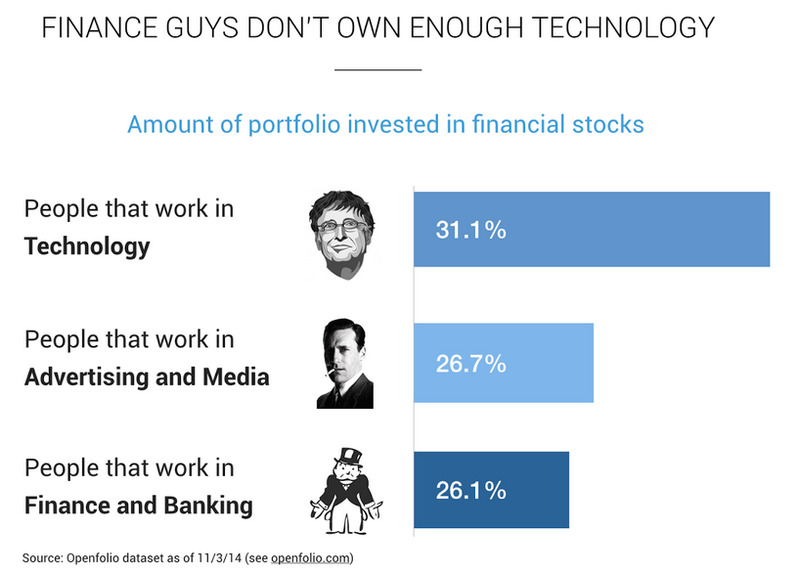 And finally, people working in technology are much more heavily invested in tech stocks than anyone else, which means they have benefitted disproportionately from the performance of successful tech companies. Openfolio, which allows users to share their investment returns, also lets users make similar analyses through its “explore” feature, which separates users into different cohorts for comparison.